New video games foretell the reign of the internal combustion engine will soon be over? The Gran Turismo 5 race car driving simulator game gives gamers their first taste of electrifying power. Computer video games are helping drive EVs from Fantasy to Reality especially for the next generation of drivers. Even the most diehard motorheads and muscle car enthusiasts can easily become EV converts after they more fully understand what 100% instant torque really means! The game features almost a thousand types of cars one might expect to see in a game like this (Ferrari, Jaguar etc), but Gran Turismo 5 will also challenge players to hone their EV racing skills as well since it also gives players the option of driving the Tesla Roadster and assorted Hybrid cars. This incarnation of Gran Turismo continues the tradition of the original video game with a well balanced blend of realism (including car damage) and arcade racing. The game can be played single or two player and with up to 16 online on twenty courses – just pick the comfy chair with the Gamer Wares online reviews and go for it. Other online options include private lobbies, voice chat, and YouTube race uploads. WRC and NASCAR have also been added to this edition of Gran Turismo to the delight of many racing fans. 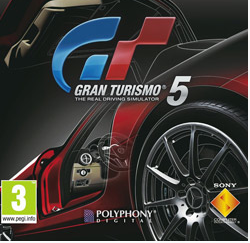 The game was developed by Polyphony Digital and published by Sony Computer Entertainment, and has currently only been released for PlayStation 3. What could be more fun that to get behind a wheel of a $100,000USD sports car and drive it just the way want and not have to worry about a few dents or burning through a set of times in just a couple of minutes. An entire gaming generation is now growing up without negative preconceived notions of what an electric car can and can’t do. The future is truly electrifying.